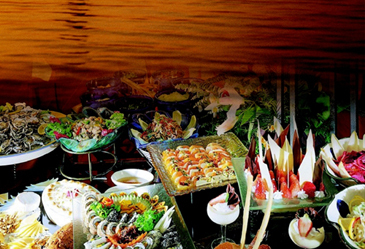 Buffet restaurant "Festival" at Novotel Ambassador Gangnam presents "Mediterranean Cuisine Festival" featuring a variety of spring cuisines from the Mediterranean countries. Recently, the Mediterranean cuisines have been favored by gourmets as low-calorie health food made of fresh vegetables, fruits, nuts, olive oil and various seafood. During the festival from April 1 to May 31, guests can experience authentic taste of various Mediterranean health dishes including "White tuna carpaccio," "Baby shrimps with orange and dill salad," "Tomato, chick pea, olive and mozzarella salad," "Bouquette of salad nisoise," "Seafood/penne gratin, Herb Crust," "Tilapia in parchment with cherry leek and chili," "Chicken cacciatore" and a lot more. Join at Festival now and enjoy a romantic dining with exotic Mediterranean dishes. Prices are 34,000won and 40,000won for lunch and dinner.